Mafac, Stronglight, Rigida, Normandy, Simplex, Atax, Peugeot, Ideale, Christophe, Segis, Lyotard, Cibie, Velox. In fact, the only things on this bike that aren't French are the Swiss-made rear rack from Pletshcer and the front wheel mechanical odometer from Joseph Lucas, Ltd in England. The tires; I can only guess, unfortunately, as the sidewalls are dried and rotted to the cords leaving no trace of the label on either side - clinchers, but no idea on the make. But, I'll bet they're French. This is the first time I've been in the midst of so much bicycle that ISN'T American. My father's old Schwinn, the polar opposite, entirely made in the States. The Trek 450, the frame is American made, with American tubing - but everything else on it is from somewhere else, mostly Japan save for the saddle and seatpost. The Trek 900, same deal there. The Kogswell is American at the lugs - most of the other work being done overseas, and the running gear a hodge podge of a lot of countries efforts. 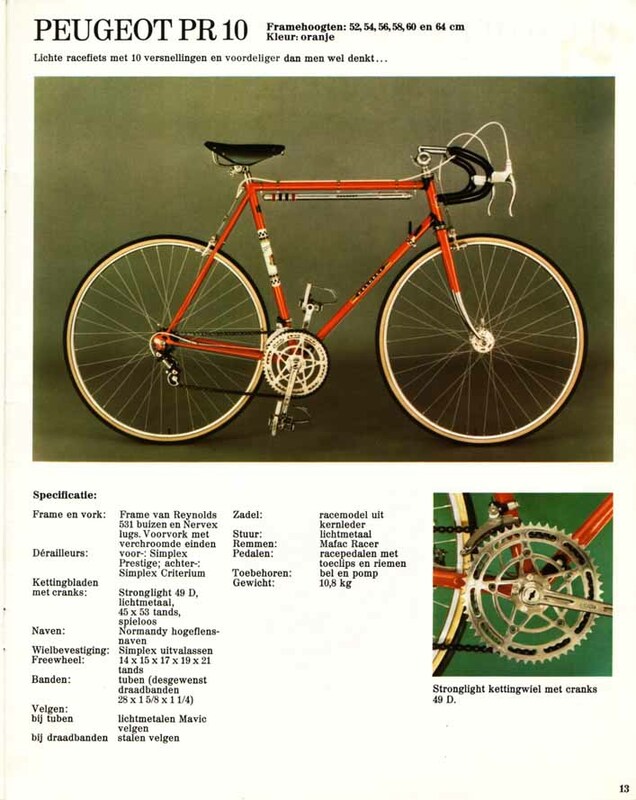 It makes me long for the old Bianchi Reparto Corse that I once had, and that I would also find a full set of Campy - because aside from the French, the Italians hold a lot of credit for bikes from the golden age of lightweight bicycles. Yeah, regret and hindsight are very pure and always twenty-twenty. For now, however, I get to play with something French, something classic. Not a hopeful garage-sale find where closer inspection reveals that everything was made in Taiwan or Malaysia. This one is pure. I currently have in my posession a 1974 Peugeot PR-10, an absolute "barn-find". Unfortunately, I don't get to keep her when I'm done. I've been commisioned to restore her, though, which is privledge enough and makes me proud that I have garnered a certain reputation for knowledge of bicycle antiquity and it's associated appreciaton and care. In finished condition, however, this is a bike that I'm sure would feel fantastic on a brevet. Taking part in a French-established tradition on a French bicycle? Where's my beret and baguette sac? Heck, yeah -- wine, cheese, and this freakin' bike... I'd be happy as a clam. I'll I'd ask is a cork-stopped metal bottle to hold some port while I ride. Maybe a cigarette. My uncle has decided that this old bike is outdated, and doesn't quite fit him the way it did when he was in his late 20's. Granted, with the shorter stem there isn't a whole lot of adjustment available, and it is more of a low racer design. He's looking towards a hybrid of sorts, and so has decided to sell this gem. There is a story with this bike, as there are with most good finds - he was riding a bike across most of Europe at the time, and was struck by a car. Thankfully he was not injured terribly, but the bike he was riding at the time was destroyed. The insurance company stepped in, and after some time gave him clearance to get a new bike which they would cover the costs of. In Holland at the time, he found a bicycle dealer and picked out this Peugeot. The tube-sticker from the shop is still affixed and legible, but my Dutch is a little rusty. SO, not only is this a complete Peugeot, it's also a Euro Peugeot, precisely as the Europeans would have enjoyed them. First, however, it needs the 34 years of grime removed from it and a going-over. New tires, new brake and derailleur cables, the usual. Most of the work involves simply delayering the bike from years of basement dust mixed with old chain lube and grease. It's a tedious process, but rewarding -- under the filth is a perfectly preserved bicycle, like I say the hallowed barn-find. A bike, purchased new, ridden, then left to sit. No modifications, no haphazard teenage son or daughter use, never left in the rain. The only wear it has is a couple of moves to new homes, and time. I've been careful to photo-document the progress so far, because it truly is all original and has a lot of bits on it that have become hard to find over the years. The Simplex-logo cable clamps for the top tube, the clamp-on frame pump stops, the Simplex rear-dropout inserts, the Mafac cable hangers. For me, this is the first time I've actually had my hands on some of these parts, after years of reading about them and seeing pictures. It's remarkable, and nothing was talked up too much to my surprise. The Mafac Racer brakes, for example -- everyone gets this notion that because of some of these things are old, they are going to be heavy and clunky. That gives engineers and designers of the past very little credit. Sure, there were price-point products back then, too, which were cheap and heavy - just like today's stuff. You have Shimano Dura-Ace, and then you have no-name derailleurs with the gold Made in China sticker on them. The 70's were no different -- but these Mafac brakes were certainly at the top of their pile. They are surprisingly light; the action - even with years of dryness and goop on them - is strong and quick. These will stop you. No question. Excellent brakes, unique design by today's standards. I instantly think how cool a set of them would look on the Kogswell, but never for an instant is there a notion that they are somehow inferior to today's stuff. Sure, a SRAM Red caliper might stop harder, and weigh next-to-nothing - but these Mafac's are classy. Matching levers, too. Interestingly, and perhaps a European thing, the cable routing for the brakes is reversed - the front brake being controlled by the right-hand lever. Upon reassembly, I'll have to remember that! The simplex derailluers are the same way -- the front is a "Criterium" model, really cool, and instead of a multi-link pivot design like is common on most everything, this uses a really interesting pushrod piston-like design. The throw of the cage is perfectly linear. It's quite interesting, actually, and once I get the drivetrain back together I'll bet it shifts marvelously. The weight, also, is surprisingly low for as much hardware is involved. The clamp that holds it to the seat tube of the bike is really over-built, but somehow still elegant. The same can be said for the rear derailleur, a Simplex "Prestige" model -- simple, elegant, effective. There is even a touch of color, the red center caps over the radial tension spring. Nice touch; not garrish. The crankset is made by Stronglight, model 49D, 53x45 teeth -- just gorgeous looking, ornate but very stiff and strong. And, LIGHT. They are very much a company that lives by their name: Strong and Light. Not anything like the Schwinn stuff of the same era, for sure. Not discounting Schwinn, mind you, but the deeper I dig into this old Peugeot I am continuously shocked how LIGHT everything is. The theme seems to be consistent: everything on here is light enough to have raced on in the 70's, with the exception of some custom wheels, perhaps: The only exception to the surprises lie in the wheels. The rear five-speed Simplex freewheel is quite heavy - as most were. A lot of metal there. The Normandy hubs are very heavy, and the Rigida rims are very stout. With the wheels removed, however, this bike really doesn't weigh that much for what's on it. Top notch. In fact, if the PX-10 was the pure racer, then this is the sport tourer -- light where you can, string where you need it -- the wheels, for example, are TRUE. Yeah, they're heavy - but this was more of a "real world" bike for the age. I see why fixie riders love their Peugeots. Every one of them looks like it could have been a track bike; when you strip everything off and put on a fixxie drivetrain, there is a very clean look left over. Peugeot wasn't much on braze-ons. The only thing brazed (or tacked) on the frame tubes is the cable stop for the rear derailleur on the driveside chainstay. That's it. The downtube shifters have their own clamp. There is a Simplex cable stop assembly clamped on above the bottom bracket shell. The cable clamps for the rear brake cable, the pump pegs, the water bottle cage. Everything has a clamp associated with it. There are no bottle bosses. The dropouts do have fittings for fenders, however - but they are Simplex dropouts, not Peugeot. A little more research reveals that this PR-10 was one notch down from the top-end PX-10 -- the PX-10 having lighter Wolber wheels, and a fork with Reynolds 5-3-1 blades. The PR-10 still has a nice fork, but I'm not sure what it's made from. The PR-10, otherwise, is all Reynolds 5-3-1 tubing with Nervex lugs, and has almost the same spec at the PX-10's that were ridden in Le Tour. By way of comparison, the PX-10 weighed 9,9 kg., and the PR-10 weighed 10,8. Not bad, but you can see the PX racing model weighed over two pounds less, and as far as I can tell it's all in the wheel-set and the fork. To be sure, I will be getting a test ride or two before she goes away. Start your bidding now, before I buy it for myself. It's also a good thing that nobody was crazy enough to sign up for this one, so I'm not leaving anyone out in the wind either, but I'm cancelling the R-12 ride tomorrow for medical reasons. I won't get into that here, but I just didn't think I should risk it: not bouncing back as well as I should have, and since it's digestive in nature it'd be best not to risk anything out on the open roads of Kansas, all alone in the dark. I'll wait until I feel 100% and reschedule - which, you know, means I'm rolling the dice in a different way at the same time: I hope the weather holds because this weekend was going to be N I C E for a bike ride! I'm a little bummed, yeah, but it's better than having an issue on the ride that I can't get around. So, stay tuned -- the R-12 will continue, just not this weekend -- I've got 28 days to squeeze it in!